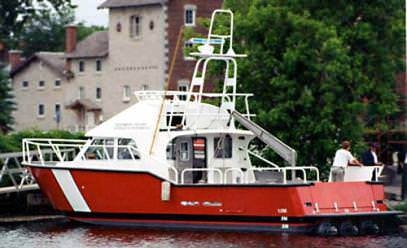 A pair of MetalCraft Marine Kingston 40 high-speed aluminum search and rescue patrol boats for the Canadian Coast Guard. The Powerlift Hull design has again proven it's ability to exceed customer expectations. 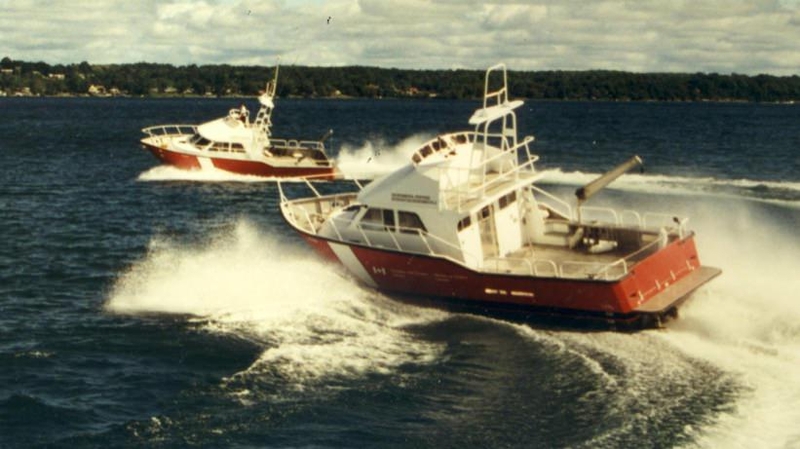 A pair of 40' cutters for the Canadian Coast Guard achieved top speeds of 33 knots light, and are able to handle heavy wave conditions. Designed for use in the Canadian Arctic, the vessels had to fill a dual role of Search and Rescue as well as Rapid Environmental Response. The large aft deck can handle pollution response equipment, and the full width drop-down tailgate and swim platform add safety and simplicity to deployment and recovery. For SAR missions, the vessel features dual drop-down side doors with integral ladders for diver and casualty recovery. The large cabin provides a secure working environment for the crew, with standard heating to extend the operating season. Forward, the cuddy features a full standing room marine head as well as berths for casualties. As configured for the Canadian Coast Guard, the vessel is powered by triple Volvo-Penta KAD 41s each producing 200 horsepower and driving through DuoProps. It achieves plane with little fuss, and can cruise comfortably and economically at 25 knots. Tracking and handling is excellent, and the vessel can execute a full+hrottle, 180- degree turn in two boat lengths. The Kingston 40 has proven itself a cost-effective way of meeting multiple roles for a work boat, and has also been used as the platform for an oil rig crew boat, a truly versatile vessel for all seasons.